Ve ry Shortly part of the NET phase 2 Clifton link will be tested for the first time. Find out more about Nottingham Midland Station improvements and walk down the Clifton link across Wilford Bridge to Wilford Lane. 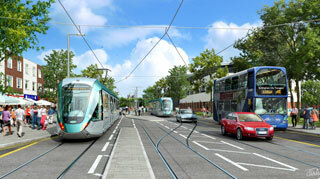 Find out about how Meadows Community Groups are embracing the Tram. More than thirty attended The Beeston and District Civic Society and the RSA Nottingham Network tram walks along the Beeston link in early June. Join us again to see first-hand what is happening on the ground with Nick Cuming of Taylor Woodrow and Sarah Alton of NET Project Office. Meet at Nottingham Midland Station booking hall, Carrington Street, Nottingham, on Wednesday 20 August 2014 at 5.45pm for a prompt 6.00pm start. Finish about 8.00pm. Come with all weather gear and good walking shoes. It is free. NCT Services; 1, 2, 3 (and all these services run every 30 mins). For more details visit: http://www.nctx.co.uk or call: 0115 950 60 70. Trent Barton Ruddington Connection service runs every hour. For more details visit: http://www.trentbarton.co.uk or call: 01773 712 265. The nearest bus stops to catch these services will be on Wilford Lane either opposite Co-Op or opposite the Roko gym. – NCT Services; 1, 2, 3 (and all these services run every 30 mins). For more details visit: http://www.nctx.co.uk or call: 0115 950 60 70. – Trent Barton Ruddington Connection service runs every hour. For more details visit: http://www.trentbarton.co.uk or call: 01773 712 265.